Want to enjoy a wellness retreat or week long intensive like no other? Hope Pedraza’s InTensive programs combine the best inBalance workouts with nutrition plans, personal fitness consultations, exclusive Q&A sessions, and gifts from Hope’s favorite partners. Participants see life-changing results and walk away feeling energized, inspired, and connected to a amazing group of people! inBalance InTensives are offered at various times of the year in various locations. All of the classes at inBalance lend perfectly to dancers (they were created by a dancer after all!). 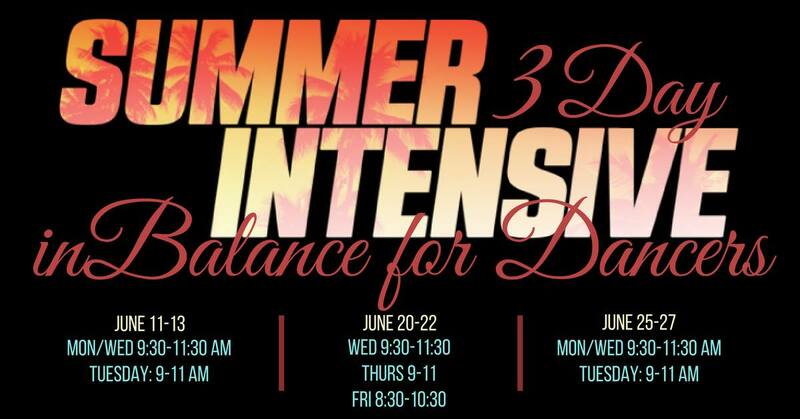 inBalance is taking their fitness and teaching methods, as well as the pattern of movements necessary to train and condition dancers to bring a Summer InTensive specifically for dancers. Designed for dancers ages 12 and up, this inTensive will build strength, coordination, and skills that dancers need to perform using our signature classes along with the Pilates apparatus like the Reformer and Wunda Chair. Choose from the dates we have each 3 day inTensive scheduled, and sign up now because space is very limited! Price is $165 for one set of 3 days.